Gata (coconut milk) and sili (chili peppers) are the two staple ingredients in Bicolano dishes. Coconut which is abundant in the Bicol Region can be picked from the backyard and grated manually before squeezing the coco milk. Every home grows a sili bush which people simply pluck and added to the daily meal. Some would even eat them raw! Meat and vegetable dishes are commonly cooked in coconut milk and spiced with chili. 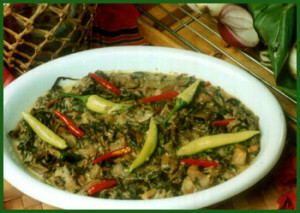 Laing is a famous Bicolano dish. It is made from shredded taro leaves, meat or seafood crumbs, and a variety of spices, wrapped in whole taro leaves. Laing is slowly cooked in gata (coco milk). But perhaps the best known outside the region is the Bicol express. It is made from bits of pork and bagoong (shrimp paste), stir-fried in coconut cream with tomato, spices, and a generous dose of green chili. Another Bicolano pride is the kinunot. Made from stingray meat, and malunggay (horseradish), an edible bitter leaf, it is cooked in coconut cream and with chili and spices added. Philippine cuisine is constantly evolving. New dishes are created from the old recipes. This is also true with Bicol dishes. How about bizarre recipes like Bicol chili ice cream? Visit the Bicol Region and taste the creative culinary ideas you’ve never tried before!